Speaking of the 2014 recruiting class...... Everybody seems to be forgetting about the 3rd commitment in the soon to be Freshman class. 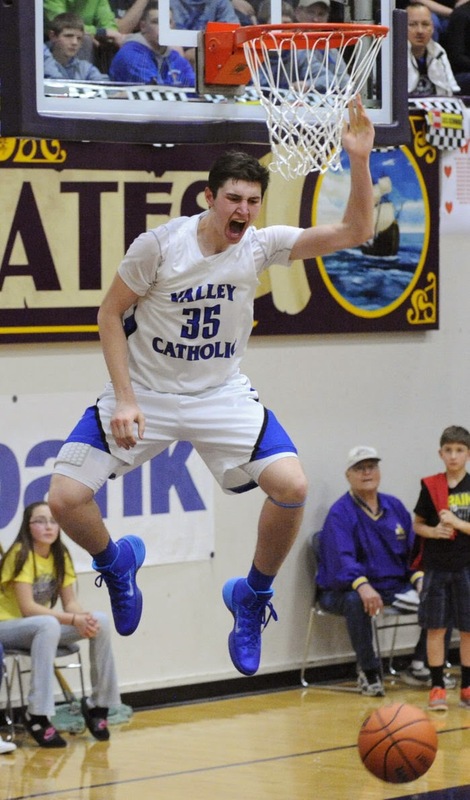 Gabe Taylor is a 6'8'' 200lb forward from Valley Catholic High School in Beaverton, Oregon. He was the 2014 Oregon 3A Player of the Year. Now I know 3A doesn't mean much to a lot of you but also take into account that he transferred from 6A Newberg after his sophomore season where he was already averaging over 20ppg. Also mix in that his coach for the last two years was none other than ex-Pilot assistant/ex PSU head coach Joel Sobotka. Hidden Gem Maybe? Only time will tell. Did I mention he's also a 3A state champion? End of the Game: Hair still looks great!